I hate the word "selfie." But I could get used to the word "shelfy." Nathan Jurgensen argued in November 2013 that "'Unplugging' from the Internet isn’t about restoring the self so much as it about stifling the desire for autonomy that technology can inspire." This idea is picked up by the New Republic this week. I do like Jurgensen's article because it shows the inauthenticity of those who claim that the Internet stand in the way of their own authenticity. Whatever authenticity is, the only one that can stand in its way is the person striving to be authentic, if only because many of the ways of striving for authenticity are themselves inauthentic. In other words, the best way to attain something approaching authenticity is by not striving for it. It's like happiness that way. Directly pursued, it tends to lead you astray. Pursuing something worth your while, it might surprise you. In any case, "mindfulness" and "unplugging" are just slogans providing false promises—or so I would argue. 1. In other words, I have not given up entirely on the notion of "authenticity" yet. Perhaps I should. As I discussed in a previous post, Heidegger thought that typewriters are "signless clouds," and that the hand was essential for thinking. So, it might be thought that he was entirely opposed to new technology in writing. This would be wrong, however, as he did adopt fountain pens. While he seems to have used dip pens, steel nibs, and inkwells when writing Being and Time, he later clearly (also) used fountain pens. Photographs show that he later used fountain pens. There is a Web site that claims that he actually used a Kaweco Elite. "The Elite was Kaweco’s top of the line and enjoyed a special embossed pattern of stair-step lines that add both grip and visual interest to this pen ... I have a photograph of Martin Heidegger writing with a Kaweco Elite and writing with this pen has always given me the covert joy of using something very special that most folks would never recognize as such." This is possible, as Kaweco was big around 1925, though it declared bankruptcy in 1929. But around 1930, "230 workers produced the Kaweco -Kadett, -Colleg, -Dia, -Elite, -Carat, -Schulkaweco, -Helios and again the Kaweco- Sport." 1. Thus, when he speaks in §15 of Being of time of "Schreibzeug" or writing "tools," he mentions "Feder, Tinte, Papier, Unterlage, Tisch ..." (nib, ink, paper, writing surface, desk ...). While this list does not prove he did not use a fountain pen at that time, it does indeed suggest that he was still using inkwell and dip pen. In any case, this practice would not have been unusual in 1925/26. 2. See here for more details. I posted some time about my my new favorite pen. One thing that is definitely an improvement over the Rotring 600 and the Rotring Newton is that it allows you easily to change the entire nib unit, and not just the nib. Like Levenger's True Writer line of pens, it mimicks the Esterbrook approach in this regard. What makes this even better is that the L-Tech (and the True Writers) will take any Standard #5 nib. I have recently exchanged the True Writer F nib for a TWSBI Mini Steel Nib Unit - Extra-Fine. There were two reasons; (1) I like an extra fine nib, (2) the TWSBI Mini nib looks more like the nibs on the original Rotrings and thus better complements the pen. The True Writer nibs have wide shoulders, the TWSBI has almost no shoulders. It is not quite as elegant as the Rotring nib, but it comes close. The operation is exceedingly simple. Holding the grip section in your right hand, with the nib up grip the nib (and fins) with your left thumb and forefinger. Turn the nib counterclockwise (or the grip and pen clockwise), and it will come out. Screw in the new nib section. It is not unreasonable to suppose that lap desks were influence by writing boxes made in such countries as Japan, Korea, and China. 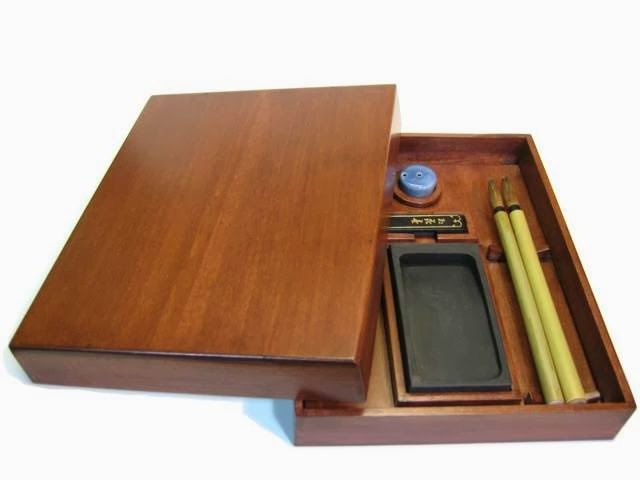 Apparently, "boxes with compartments for an ink stone, ink stick, water dropper, and brushes, became popular during the Muromachi period (1392-1573)." 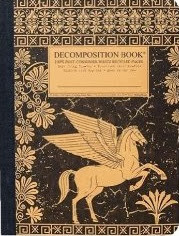 They were often highly elaborate decorated with lacquer textures and finishes. Here is the picture of a very simple one that appeals to me. I was tempted at the last antique show in Brimfield to buy a much more elaborate one in metal. I resisted the temptation and am glad, as I need one of these implements as much as I need a hole in my head. Whereas the Tea Caddy and the Sewing Box can be said to be accurate reflections of the stylistic and cultural influences of the 18th and 19th centuries, the Writing Box epitomizes the social and economic developments of this particular period. Portable boxes for writing materials had existed for many centuries and in many cultures. However it was not until the last decades of the 18th century that the socio-economic circumstances in England necessitated the wide use of a portable desk in the form of a box which could be used on a table or on one's lap. Hence 'Lap Desk'. There is no reason why these implements could not still be useful today (to those who write by hand). also easier to recycle." They are made in the U.S.A.
See here for another detailed account of how Scrivener is serviceable as a note-taking application. I especially like the author's suggestions for project management. In fact, the title of the post could have been called: "Scrivener as a note-taking/project management app." The phrase does occur in the post itself. Apparently, his servant was illiterate. Hence, the pictures. 1. By way of Open Culture. "Handwritten amended pages are no longer acceptable at the European Patent Office (EPO), as of 1 January. Under the European Patent Convention, applicants were required to submit typed or printed descriptions, claims and abstracts but handwritten amended pages were admissible during proceedings, and were common during oral proceedings. However, the EPO has now stopped this practice as it intends to produce the text of the patent electronically, and therefore needs all pages in a form that can be processed."